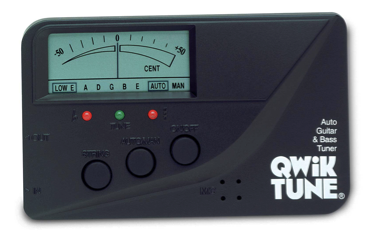 As a beginner the best way to tune your guitar is to use an electronic tuner. There are many different types of tuner however the best two versions are shown below. These tuners are great as they are completely silent, making them perfect for home or live use. These tuners work by sensing the vibration through the neck when a single string is struck. This then tells the tuner what note it is, which allows you to tune that string. 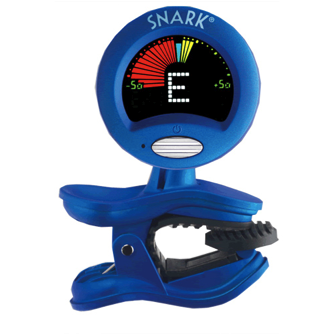 These tuners are great for both acoustic and electric guitars. These tuners have been around for many years and again are silent tuners, as they require you to plug you guitar into them via a jack conection. Most of these tuners have a microphone in them, which allows you to hold an acoustic guitar close to the tuner and it will sense the string using the microphone. Again making these tuners great for both styles of guitar. These tuners also have an option for playing the sound of each string, which will allow you to match the pitch of each string to the notes played by the tuner.